A 10-year study of Chesapeake Bay fishes by researchers at the Virginia Institute of Marine Science provides the first quantitative evidence on a bay-wide scale that low-oxygen "dead zones" are impacting the distribution and abundance of "demersal" fishes—those that live and feed near the Bay bottom. The affected species—which include Atlantic croaker, white perch, spot, striped bass, and summer flounder—are a key part of the Chesapeake Bay ecosystem and support important commercial and recreational fisheries. The study, published in the May issue of Marine Ecology Progress Series, was authored by Andre Buchheister, a Ph.D. student in William & Mary’s School of Marine Science at VIMS, along with VIMS colleagues Chris Bonzek, Jim Gartland, and Dr. Rob Latour. All four authors are involved in VIMS’ Chesapeake Bay Multi-Species Monitoring and Assessment Program (ChesMMAP), an ongoing effort to track and understand interactions between and among fishes and other marine life within the Bay ecosystem. 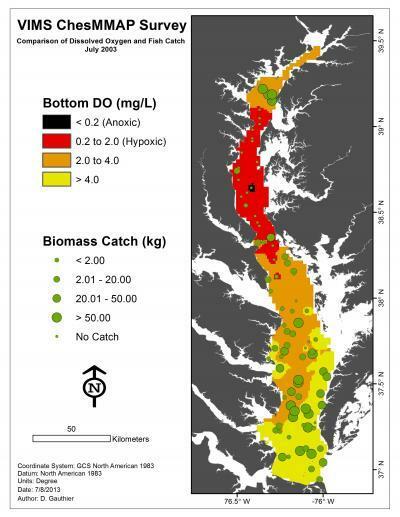 Buchheister says "This is the first study to document that chronically low levels of dissolved oxygen in Chesapeake Bay can reduce the number and catch rates of demersal fish species on a large scale." He notes that other studies have looked at the effects of low oxygen on fishes within the water column and on demersal fishes within individual Bay tributaries. Low-oxygen conditions—what scientists call "hypoxia"—form when excessive loads of nitrogen from fertilizers, sewage, and other sources feed algal blooms in coastal waters. When these algae die and sink, they provide a rich food source for bacteria, which in the act of decomposition take up dissolved oxygen from nearby waters. VIMS researchers Andre Buchheister and Jason Romine prepare to sort the trawl-net catch during a ChesMMAP cruise on Chesapeake Bay. In Chesapeake Bay, low-oxygen conditions are most pronounced in mid-summer, and in the deep waters of the Bay’s middle reaches. "This appears to displace fish biomass toward the northern and southern edges of the bay’s mainstem channel," says Buchheister. "The drastic decline we saw in species richness, species diversity, and catch rate under low-oxygen conditions is consistent with work from other systems," he adds. "It suggests that demersal fishes begin to avoid an area when levels of dissolved oxygen drop below about 4 milligrams per liter, as they start to suffer physiological stress." The fishes’ response at this level is interesting, says Buchheister, "because it occurs at levels greater than the 2 milligrams per liter that scientists formally use to define hypoxia." Normal coastal waters contain from 7-8 milligrams of oxygen per liter. Previous research suggests that oxygen-poor waters can stress fish directly, through increased respiration and elevated metabolism, and also by affecting their prey. "Low levels of dissolved oxygen stress or kill the bottom-dwelling invertebrates that demersal fishes rely on for food," says Buchheister. "Prolonged exposure of these invertebrates to hypoxic conditions in the mid-Bay represents a substantial reduction in the habitat available for foraging by demersal fishes baywide, and could reduce the quality of foraging habitat even after bottom waters become re-oxygenated." Data from VIMS’ ChesMMAP survey illustrate the large dead zone that developed in Chesapeake Bay in the late summer of 2003. Dead zone in red in relation to fish catches (green circles). The authors caution, however, that the limits on fish abundance and distribution brought on by low-oxygen conditions are to some degree balanced by the positive effects that nutrients have on production of mid-water and surface-dwelling fishes elsewhere in the Bay. The nutrient-rich waters that encourage dead-zone formation also fuel algal growth, thus turbocharging the base of a food web that ultimately supports fish and other predators. The team’s findings are based on an exhaustive study of the distribution and abundance of late juvenile and adult fishes caught and released in trawl nets during 48 sampling trips between 2002 and 2011, the largest quantitative assessment of the bay-wide demersal fish community ever conducted. The sampling took place at 3,640 ChesMMAP stations throughout the mainstem of Chesapeake Bay. ChesMMAP, currently funded by Wallop-Breaux funds from the Virginia Marine Resources Commission, was established in 2002 as part of the growing international recognition that a single-species approach to fisheries management does not fully account for the complex interactions within marine ecosystems. Indeed, the team’s research shows that salinity is the most important factor affecting the distribution of Bay fishes, whether they live near the bottom or towards the surface. "Salinity was the major environmental gradient structuring community composition, biodiversity, and catch rates in our 10-year dataset," says Buchheister. "The saltier waters of the lower Bay and the fresher waters of the upper Bay generally have a more diverse and dynamic fish fauna than the middle Bay, whose brackish waters place physiological demands on many aquatic organisms." The value of the ChesMMAP dataset extends beyond the current study. "Our work provides a 10-year frame of reference that can be used to evaluate future large-scale changes in the composition, distribution, and abundance of the Bay’s demersal fish community," says Latour. "Continued monitoring will be critical for detecting how the Bay ecosystem responds to continued stresses from fishing, development, and climate change. It’s an essential component to a successful management strategy for the marine resources of Chesapeake Bay and the coastal Atlantic." 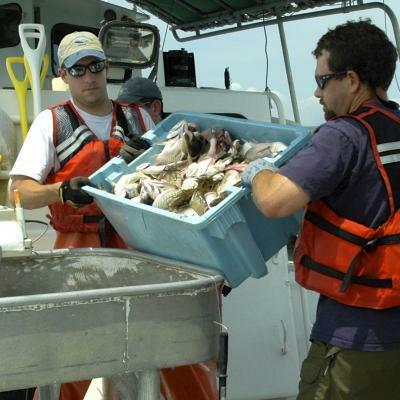 This image shows an example of the size and kinds of fish collected during ChesMMAP cruises on Chesapeake Bay. 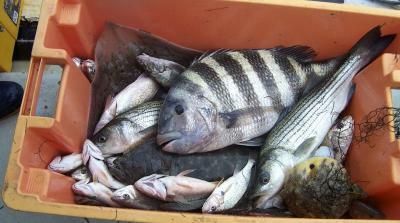 Shown are a large sheepshead, several striped bass, and a few other species including summer flounder, Atlantic croaker, Northern puffer, a Clearnose skate, and a kingfish.